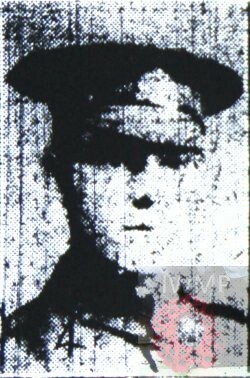 Died: 10th April 1918; age 31; Died of Wounds – Gun Shot Wound to the right shoulder & chest – 6th General Hospital, Rouen, France. Enlistment Details: Location: Ipswich; Date: 26th July 1905; Age: 18 years; Occupation: Labourer; Religion: CofE. Height: 5ft 6 3/4ins, fresh complexion, blue eyes, brown hair. Tattoo – arrow through a heart with the words ‘TRUE LOVE’ on left forearm. Service: Home: 26th July 1905 – 7th November 1905 – Malta 8th April 1905 – 21st January 1909 – Egypt 22nd January 1909 – 9th October 1911 – Home – 10th October 1911 – BEF 10th September 1914 – 26th October 1914 – Home 27th October 1914 – 8th December 1916 – embarked Southampton – BEF 9th December 1916 – disembarked Havre – arrived & posted 2nd K.R.R.C. – Havre – 10th April 1918. Offence: Malta – 15th September 1907 – Wilfully absenting himself from church parade – 8 days C.B. Date of Entry Therein: 10th September 1914. Wounded: 22nd October 1914 – Shrapnel wound – Head – in the field – 17th Field Hospital – 3rd Clearing Hospital. Wounded: 24th March 1918 – Gun Shot Wound to the right shoulder 6th General Hospital, Rouen – died 10th April 1918. Regiment: The Rifle Brigade, 7th Battalion. Relatives Notified & Address: Son of George & Emma Clifford, of Ipswich; husband of Maud Minnie Wardley (formerly Clifford), of 84, Wallace Road, Ipswich. 1891 4, Rope Walk Court, Ipswich. George was 3 years old and living with his parents & sisters. George Clifford, 35, a Musician – Professional Concertina Player & Performer – own account, born Edwardstone, Suffolk. Emma Clifford (nee Brewster), 26, born Bury St. Edmunds, Suffolk. Annie Brewster Clifford, 6, born Bury St. Edmunds. Florence Clifford, 4, born Ipswich. 1901 25, Rope Walk, Ipswich. George was 13 years old, a Servant – Errand Boy. He was living with his employer – 59 year old, Alfred Easty, a Fish Merchant. George was 22 years old, a Soldier ranked Rifleman for the 4th Battalion of The Rifle Brigade. Occupation – Labourer. On the 5th March 1916, at St. John the Baptist, Ipswich, George married Maud Minnie Murton, born 1885, Ipswich. 1 disc, 1 book, 1 token, letters, photos, a card. wallet & a match box holder. On the 12th November 1919, Maud Clifford signed for the Memorial Plaque & Scroll, she wrote ‘Thank You’ over the form. Mrs M.M. Clifford received George’s British War medal in 1921.